Cassidy Hooper, right, is among more than hundred singers from around Charlotte who will perform Benjamin Britten's "War Requiem" at CPCC April 13-14. Cassidy Hooper, 22, is pretty typical for a college student. She's trying to keep up with sociology and American government classes at Central Piedmont Community College, juggling a weekend job at Carowinds, and on top of that, she's spent the last few months learning the music to Benjamin Britten's 1962 masterpiece "War Requiem," to be performed this weekend at CPCC. Unlike the rest of the chorus, Hooper, who is blind, has been learning the music from a score written in Braille. On a recent rainy afternoon, rehearsal was underway at CPCC's Halton Theater. 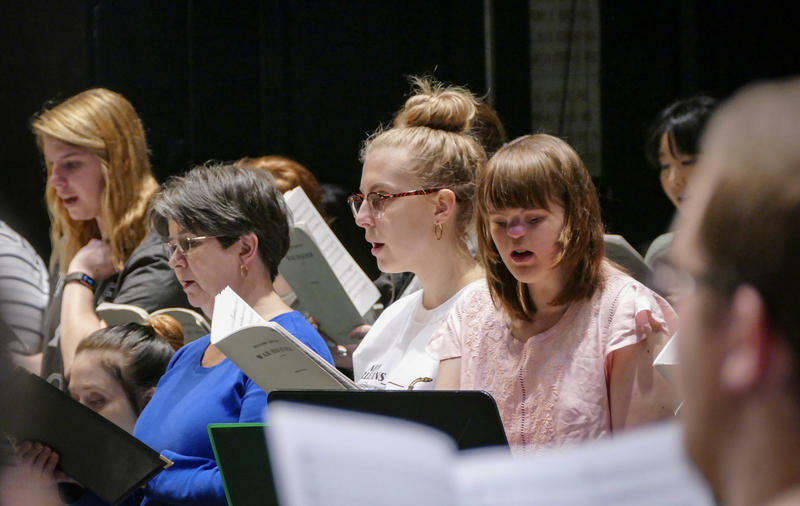 Hooper and about a hundred other singers from choirs around the city worked with conductor Alan Yamamoto through one of the more intimate movements of Britten's work. Hooper is a soprano, and during a break in the rehearsal, she said she likes the music. She also said she has diverse taste outside of the classical genre. "I love a lot of '80s music," she said. "People tell me all the time, they say, 'Cassidy, what do you know about hair bands?' Uh, I was born listening to all of them." Hooper, who is the middle of three sisters, said her whole family will jam out to Whitney Houston, Bryan Adams or the Hamilton soundtrack. As far as singing with large choirs goes, Hooper is a seasoned pro. She has preformed with combined choirs while at the Governor Morehead School for the Blind in Raleigh. That's also where she learned to play a whole host of other instruments in the school band. "I played cello," Hooper said. "I played recorder, clarinet, alto sax, orchestra bells, marimba." She also tried violin, but decided it wasn't for her. "I didn't like it under my chin," She said with a laugh. "I just don't like the way it feels. It feels weird." It was also at the school for the blind where she first encountered musical scores written in Braille, which she admitted is not the easiest thing to read. "I still have trouble with it to this day," she said. "The music itself, it just looks weird. Reading in Braille, I mean. That's just me." As she explained, Braille has six dots that make up a cell. That cell is how you make words or letters. In music, if a note has a 'dot six' in it, it's a quarter note. If it has a 'dot three,' it's a half note. If there's neither a 'dot six' nor a 'dot three,' it's an eighth note. If it has both a 'dot three' and a 'dot six,' it's a whole note. If that seems like a lot to keep up with, keep in mind that's just the rhythm of the notes. Hooper also has to figure out the pitch and read the words, all at the same time. Hooper said for "War Requiem," she usually ends up just focusing on reading the lyrics and learning the notes by ear. Come this weekend, both her parents will be in the audience for CPCC's production. The concert will also be a special one for Hooper because it will be her last at CPCC. Next semester, she's planning to transfer to a Bible college, where she plans to major in worship leading and radio broadcasting. She said she knows whatever she ends up doing in life, music will definitely play a part. "Music is my vision," she said. "It's what makes me see the world." CPCC's performance of "War Requiem" is April 13-14 at the school's Halton Theater.